With the arrival of the new Nutrient Management Guide (RB209) from AHDB, the Wholecrop Cereal recommendations for Phosphate and Potash have been included. In the past, in the absence of good information on Wholecrop generally, advisers have often used “grass for silage” recommendations instead, reflecting the greener nature of under-ripe cereals cut for Wholecrop silage. Wholecrop cereals are now much more widely grown and they are a feed for AD plants. 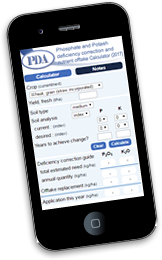 At PDA we advise that phosphate and potash recommendations for Wholecrop should be made on the basis of the expected fresh yield multiplied by the offtake values, which are quoted in our Nutrients in Crop Material leaflet (or in RB209 Grass and Forage Section 1, p.10.). This will give the “maintenance” amount and is correct for soils at target index. At low index an additional build amount is required, and at high index a rundown amount can be deducted, all as usual. The crop offtake values for Wholecrop Cereals (c.35%DM) are 1.8kg P2O5/t fresh yield and 5.4 kg K2O/t fresh yield. So a typical fresh yield of 30t/ha would require 54 kg P2O5/ha and 162 kg K2O/ha for maintenance at target index. We advise that this is a better means of making the recommendations than using the estimated grain yield of the cereal crop, as if it was to be harvested for grain and straw. This grain yield based system is in RB209 Grass and Forage Section 2, p.32 and is likely to be the subject of a revision/clarification soon. As it stands, it significantly underestimates the Potash required.